Growing potatoes (Solanum tuberosum) have been easy to do in the DDC garden. My favorite is Yukon Gold which I have a lot planted this year (2007). Others we have grown successfully in the past are Red Pontiac and the white Kennebec. Do not grow potatoes in the same location until 3 years have passed. Disease and bugs persist and need this long to die off. Potatoes are a cool season vegetable. They grow best in soil that is between 60 and 70 degrees. They will not form when the soil is 80 degrees or higher. There are literally over a hundred varieties of potatoes in a multitude of colors. As mentioned before we have had very good luck with Yukon Gold, Kennebec, and Red Pontiac. Another variety I have seen at the stores is Viking which is a red skinned potato. Use seed potatoes, not ones from the grocery store. Grocery store potatoes have been sprayed to prevent the eyes from sprouting. Good seed potatoes are chemical and disease-free. Potatoes are among the first crops planted in the spring. I usually plant them the mid April or when the soil is workable. Planting too early may result in rot if the ground stays wet. Cut the seed potatoes in quarters and make sure there is at least one eye in the quarter. Once cut let them sit for a day or two so a crust develops over the cut part. This reduces the chance of rotting. The eye(s) will become the stem so it needs to be planted facing up. There should only be one or two eyes on the cut potato. Full sun is the best for potatoes. Potatoes mature 90 to 120 days after planting, depending on the variety. I have always used seed potatoes rather than ones left over from the year before (though many farmers practice this). The seed potato is cut up in pieces where each piece has at least one “eye”. Each piece is planted about 12 inches apart in a trench about 3 inches deep. I use a hand plow to dig the trench. Each row is 2 feet apart. Placing straw about 4 inches thick or mulch in between the rows help keep moisture in and lower the ground temperature by 10 degrees. Yukon Gold have low drought tolerance so keep an eye on them. The soil should be well-drained and fertile. Compacted soil or clay soil will produce misshapen tubers. Keep the potatoes evenly watered so they do not get knobs (secondary growth). Water early in the day and try not to water the foliage. 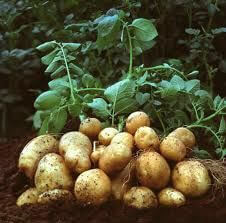 After the plant has grown several inches, mound soil around the plant so the potatoes do not turn green from sunlight. After the plant is about a foot high, side-dress the potatoes with 10-10-10 fertilizer about 6 inches from the plant lightly scratched into the ground. Normally potatoes are harvested after the vines die but if you want new potatoes (small, 1 to 2 inches in diameter) harvest them two or three weeks after the potato flowers. Since potatoes are about 8 inches underground I use a potato fork. Normal yield is about eight potatoes per vine. Late potatoes are harvested around August or early September. Two to three weeks before harvesting, cut the potato plants to ground level. This gives the potato skins time to toughen which makes for better storage. Most potatoes can be stored in a cool (40 to 50 degrees), dark place (not the refrigerator since the starches will be converted to sugars and give the potato an oddly sweet taste.) for several weeks. Yukon Gold do not store as well as others. If parts of the potato turn green just remove the green part and eat away. Potatoes do not freeze or can well. Do not wash potatoes until they are ready to use. Washing them shortens their storage span. Cucumbers do not like their root system disturbed, so if you decide to start them indoors, use a peat pot so they can be directly transplanted. Cucumbers can grow as a vine or as a bush. Growing as a vine on a trellis keeps the fruit clean. Purchase some cucumber seeds according to what you intend to use them for. 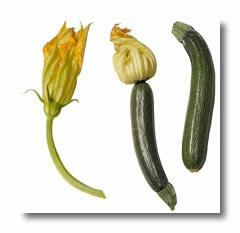 Cucumber varieties are divided into pickling, slicing, burpless and space-saver variety categories. Burpless cucumbers, both American and Asian types, contain low or no cucurbitacin, the compound that causes bitterness and increases one’s susceptibility to ‘burping’ after eating the fruits. Decide if you want to give your cucumbers a head start by germinating them indoors (in peat pots, planting cells or pots) or waiting until there is absolutely no chance of frost left (2 weeks after last frost), and planting them right out into your vegetable garden. Choose where in your garden is best suited for growing cucumbers. Cucumbers require full sun and plenty of warmth to grow. They also require soil that is quick draining; cucumbers do not tolerate having soggy roots. To plant directly in the ground, prepare the area you want to plant your cucumber seeds. Turn the area over with a shovel and work in fertilizer at approximately one pound per 100 square feet. Use your rake to level and smooth the area. Make a hill before planting the cucumber. Just a small rise in the ground is adequate. Build the hill, or mound, about a foot in diameter and about three inches high; this is to drain water from around the stem. Plant the cucumber in the mound. With your trowel, dig 1-inch deep holes that are six to eight inches apart. Each row should be spaced at approximately three feet apart. Place two to three seeds in each hole and cover the hole up firmly with dirt. 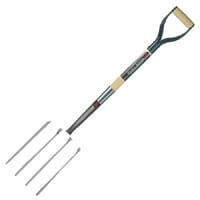 Now is a good time to use garden stakes so that you know exactly where you planted your seeds. Check the seeds every day, keep the seeds moist, not drenched. Once your cucumber seedlings get to be approximately three to four inches tall, thin them out so that only one plant remains in each planted area. Continue to keep your cucumbers well watered. The National Gardening Association recommends keeping the soil evenly moist to prevent cucumbers from becoming bitter. Try not to get moisture on the leaves which will help prevent leaf-related diseases. The National Gardening Association also suggests that when your cucumbers reach about four weeks of age, to fertilize them with a 5-10-10 fertilizer (5% nitrogen, 10% phosphorus and 10% potassium). In approximately 55 to 65 days, your cucumbers should be ready for harvesting. Start cucumbers inside 2 to 3 weeks before bringing outside. It is best to use peat pots so they do not have to be replanted as cukes do not like having their root system disturbed. Fill up each peat pot, or planting cells, three-quarters full with seed starting mix. Water each thoroughly, making sure you have a tray underneath to catch the excess water. Place two to three seeds into each planting receptacle, cover with one inch of the seed starting mix. It’s imperative to maintain an adequate amount of light for your cucumber seeds to germinate. They should receive 12 to 14 hours of sunshine a day. Temperature should be kept above 55 degree F.
Check the seeds daily, keep them moist by spritzing with water as soon as the soil dries out. After the seeds have sprouted, it’s recommended you thin them down to only one cucumber seedling per planting receptacle. When seedlings achieve about three inches in height, you can plant them out of doors right into your vegetable garden. With your trowel, dig holes that are double the size of each of your planting receptacles. Do not need to remove the seedlings from the peat pots. To remove your cucumbers from pots, support the base of the plant with two fingers, turn upside down and gently tap the edge of the pot with your trowel until the pot begin to slide off. To remove from cells, simply push up from the bottom. Put the cells/pots aside. Position your cucumber plant in a hole, make sure to line up the base of the plant level with the ground. While holding the cucumber in the hole, use your trowel and fill in the hole with plenty of dirt. Firm the soil with your hand, to remove air pockets. Water each of your cucumber seedlings carefully, don’t saturate them, but water at the base of the plant and let the water soak in thoroughly. (Proceed from Step 7 above, in the section titled Planting Cucumbers). Add cukes as succession plantings. Because cucumbers crave heat, they can follow cool spring crops of peas, spinach, and lettuce. Provide steady moisture. A continuous water supply is necessary for the best quality fruits. A drip irrigation system is ideal in the cucumber patch. If this is not possible, water deeply once a week, applying at least one inch of water. Frequent but shallow watering will reduce overall yields. Feed cucumbers well. Cucumbers, like other cucurbits (squash, melons, and pumpkins), are heavy feeders. If organic matter was incorporated into the soil prior to planting, fertilizer will not be needed early in the season. However, when the cucumber plants begin to blossom and set fruit, a side dressing of balanced soluble fertilizer will help keep the plants in production. Use mulch to regulate the ground temperature. Make sure that you see both male and female blooms. Male blooms usually appear first and then drop off, so don’t be alarmed if this happens. Within a week or two, female flowers will also appear; each one has a small cucumber-shaped swelling at the base that will become a cucumber. Several pests bother cucumbers. Squash bugs may attack seedlings. Slugs like ripening fruit. Aphids can colonize leaves and buds. Straw mulch helps keep slugs at bay, as can trellising vines to get the fruit off the ground. Vines are also bothered by cucumber beetles, which chew holes in leaves and flowers and scar stems and fruits, but worse than that, they spread a disease that causes the plants to wilt and die. Powdery mildew is a disease that leaves white, mildew-like patches on the leaves. Apply fungicides at the first sign of its presence. To minimize disease spread, avoid harvesting or handling vines when leaves are wet. You can pick cucumbers whenever they’re big enough to use. Check vines daily as the fruit starts to appear because they enlarge quickly. Vines produce more fruit the more you harvest. To remove the fruit, use a knife or clippers, cutting the stem above the fruit. Pulling them may damage the vine. Don’t let the cucumbers get oversized or they will be bitter, and will also keep the vine from producing more. Yellowing at the bottom (blossom end) of a cucumber signals overripeness; remove the fruit immediately. Harvest lemon cucumbers just before they begin turning yellow. Although they are called lemon cucumber because the little oblong or round fruits turn yellow and look like a lemon, by the time the fruit turns yellow it may be a little too seedy for most tastes. You can keep harvested cucumbers in the refrigerator for 7 to 10 days, but use them as soon as possible after picking for best flaor. If you don’t eat a slicing cucumber all at once, cover the unused portion in plastic wrap to prevent dehydration in the refrigerator. In fact, it’s a good idea to wrap your whole cucumbers in plastic or store them in a zipper bag in the fridge to keep them crisp. Bitter-tasting cucumbers are a common problem caused by high temperatures, dry soil, low fertility, or disease. Unhealthy plants produce poor-quality fruit. Once a plant produces a bitter cucumber, it must be removed because all subsequent cucumbers will be affected the same way. Asparagus was first cultivated about 2500 years ago in Greece. Asparagus is a Greek word, meaning stalk or shoot. The Greeks believed asparagus was a herbal medicine which, among other things, would cure toothaches and prevent bee stings. Second century Physician, Galen, described asparagus as “cleansing and healing”. Claims for medicinal benefits of asparagus persist to this day. The Romans became great lovers of asparagus, and grew it in high-walled courtyards. In their conquests, they spread it to the Gauls, Germans, Britains and from there, the rest of the world. The asparagus plant is a member of the lily family, which also includes onions, leeks and garlic. Asparagus is a hardy perennial. It is the only common vegetable that grows wild along roadsides and railroad tracks over a large part of the country. Although establishing a good asparagus bed requires considerable work, your efforts will be rewarded. A well-planned bed can last from 20 to 30 years. For this reason, asparagus should be planted at the side or end of the garden, where it will not be disturbed by normal garden cultivation. Asparagus is one of the first vegetables ready to harvest in the spring. Harvest early Spring through June. After harvest, fertilize with 12-12-12 at 2 pounds per 100 square feet. Snap off all remaining spears. In the fall after the first freeze, trim the fern a few inches from the ground. They are still being offered; but a number of new varieties that are either predominantly or all male recently have been introduced in to common usage. Asparagus plants are naturally either male or female. The female plants bear seeds, which take considerable energy from the plant and sprout new seedlings, which cause overcrowding in the bed. Male plants produce thicker, larger spears because they put no energy into seeds and have no weedy seedling problem. A line that produces only male plants was discovered and has been incorporated into some truly amazing varieties. These are new hybrids with larger yields. It is advisable to plant the best variety available, as an asparagus bed should remain productive for at least 15 to 20 years. If you are starting a new bed, you may never get to choose a variety again if your bed produces that long. All the newer varieties are cold tolerant and are resistant to rust and fusarium. Select the new all-male hybrid asparagus varieties such as Jersey Giant, Jersey Prince, and Jersey Knight. These varieties produce spears only on male plants. Seeds produced on female plants fall to the ground and become a seedling weed problem in the garden. Female plants also have to expend more energy to produce the seeds that decreases the yields of asparagus spears on female plants. The all-male hybrids out-yield the old Mary Washington varieties by 3 to 1. The asparagus fern is the key to growth. It is the conduit to the crown and provides nutrients to the roots for next year’s crops. It should not be trimmed until the first frost. Asparagus grows in most any soil as long as it has good internal drainage. Asparagus roots do not like waterlogged soils which will lead to root rot. It prefers a soil pH of 6.5-7.5., and will not do well if the pH is less than 6.0. Have the soil tested to determine phosphorus and potassium needs; or add 20 lbs of a 10-20-10 or similar analysis fertilizer per 1,000 square feet, tilled to a 6 inch depth before planting. Asparagus should be planted as soon as the ground can be worked in the spring. One-year-old crowns or plants are preferred. Seeds are sown in a production bed and allowed to grow for a year. However, caring for the small seedlings until they become established can be time consuming. Also, because the seeds are spaced a few inches apart, the crowns will have to be dug and transplanted to their permanent, wider-spaced location in the garden after one year. The young plants have compact buds in the center (crown), with numerous dangling, pencil-sized roots. Adventurous gardeners can start their own plants from seed. Although this adds a year to the process of establishing the bed, it does ensure fresh plants and the widest possible variety selection. Buy one-year-old, healthy, disease-free crowns from a reputable crown grower. A crown is the root system of a one-year-old asparagus plant that is grown from seed. Each crown can produce 1/2 lb. of spears per year when fully established. Asparagus can be planted from mid-April to late May after the soil has warmed up to about 50 degrees F. There is no advantage to planting the crowns in cold, wet soils. They will not grow until the soil warms and there is danger of the plants being more susceptible to Fusarium crown rot if crowns are exposed to cold, wet soils over a prolonged period. 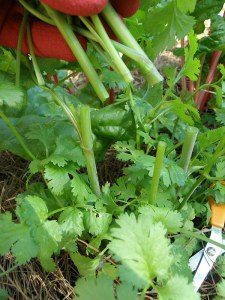 Plant the asparagus at either the west or north side of the garden so that it will not shade the other vegetables and will not be injured when the rest of the garden is tilled. Place the plants in a trench 12 to 18 inches wide and a full six inches deep. The crowns should be spaced 1 foot apart. Spread the roots out uniformly, with the crown bud side up, in an upright, centered position, slightly higher than the roots. Apply about 1 lb. of 0-46-0 (triple superphosphate) or 2 lbs. of 0-20-0 (superphosphate) fertilizer per 50 feet of row in the bottom of the furrow before planting. This will make phosphorus immediately available to the crowns. Omitting this procedure will result in decreased yields and the spear production will not be as vigorous. If more than one row is planted, space the rows five feet apart from center to center. Wide between-row spacing is necessary because the vigorously growing fern will fill in the space quickly. Wide spacing also promotes rapid drying of the fern to help prevent the onset of fungus diseases. Cover the crown with two inches of soil. Gradually fill the remaining portion of the trench during the first summer as the plants grow taller. Asparagus has a tendency to “rise” as the plants mature, the crowns gradually growing closer to the soil surface. Many gardeners apply an additional 1 to 2 inches of soil from between the rows in later years. However, do not compact the soil over the newly filled furrow or the emergence of the asparagus will be severely reduced. Spears should emerge within one week in moist soils. Do not harvest the asparagus during the planting year. Spears will be produced from expanded buds on the crown. As the spears elongate and reach a height of about 8 to 9 inches, the tips will open. The spear will become woody to support the small branchlets that become ferns. The ferns produce food for the plant and then move it down to the crown for next year’s spear production. Asparagus is very drought tolerant and can usually grow without supplemental watering because it seeks moisture deep in the soil. However, if rainfall is insufficient when planting or afterwards, it is beneficial to irrigate the crowns. Otherwise the plants will become stressed and vigorous growth will be impeded. Because asparagus remain in place for years, advance soil preparation helps future production greatly. Working green manure crops, compost, manure, or other organic materials into the proposed bed well in advance of planting is a good approach. Asparagus should be fertilized in the same way as the rest of the garden the first 3 years. In the spring, apply 10-10-10, 12-12-12 or 15-15-15 fertilizer at the rate of 20 to 25 pounds per 1,000 square feet of area or 2 pounds per 100 square feet and incorporate with soil tillage. Starting in the fourth year, apply the same amount of fertilizer but delay application until June or July (immediately after the final harvest). This approach encourages vigorous growth of the “fern,” which produces and stores nutrients in the roots for next year’s production season. Weeds and grasses are the worst problems with asparagus. They compete with the developing spears, make an unsightly area in the garden and significantly decrease yield and quality. Start frequent, light, shallow cultivation early in the spring in both young plantings and mature patches that are being harvested. Weed control can be accomplished by hand hoeing and cultivating during the planting year since there are no herbicides labeled for use in asparagus during the first year. Labeled pre-emergence herbicides may be used during the second spring, by applying it over the shredded fern, about three weeks before spear emergence . Do not use salt as a weed killer. 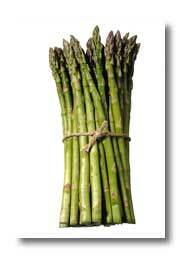 It will not harm the asparagus, but it inhibits water penetration in the soil. 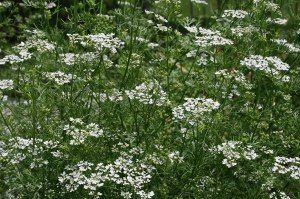 Also, rains can leach the salt out of the asparagus bed and into the rest of the garden, injuring other vegetables that are less salt tolerant than asparagus. Harvest spears 5 to 8 inches in length by cutting or snapping. To cut a spear, run a knife into the soil at the base of the spear and carefully sever it. Because the spear is cut below the point where fiber develops, it becomes necessary to remove the fibrous base from the tender stalk. Cutting may damage some spear tips that have not yet emerged from the ground. To snap a spear, grasp it near the base and bend it toward the ground. The spear breaks at the lowest point where it is free of fiber. There is no need to cut asparagus below the soil with a knife. This may injure other buds on the crown that will send up new spears. The small stub that is left in the soil after snapping, dries up and disintegrates. A new spear does not come up at the same spot, but comes up from another bud that enlarges on another part of the crown. As the tips of the spears start to loosen (known as “ferning out”), fiber begins to develop at the base of the spears, causing them to become tough. The diameter of the spear has no bearing on its toughness. When harvesting, the asparagus patch should be picked clean, never allowing any spears to fern out, as this gives asparagus beetles an excellent site to lay their eggs. The year after planting, asparagus can be harvested several times throughout a three-week period, depending on air temperatures. Research shows there is no need to wait two years after planting before harvesting. In fact, harvesting the year after planting will stimulate more bud production on the crown and provide greater yields in future years, as compared with waiting two years before harvesting. Asparagus spears will start to emerge when the soil temperature reaches 50 degrees F. After this, growth of asparagus is dependent on air temperature. Early in the season, 7 to 9 inch spears might be harvested every 2 to 4 days. As air temperatures increase, harvesting frequencies will increase to once or twice per day, harvesting 5 to 7 inch spears before the tips start to fern out and lose quality. The second year after planting, the length of harvest can increase to about 4 to 6 weeks. The third year after planting and thereafter, harvesting can continue for 6 to 8 weeks. Since the length of harvest season will vary from year-to-year depending on air temperature, stop the harvest when the diameter of 3/4 of the spears becomes small (less then 3/8 inch). Experience gained by growing the crop will make it easier for the gardener to know when to discontinue the harvest. When harvest is finished, snap all the spears off at ground level. New spears will then emerge, fern out, and provide a large canopy to cover the space between the rows. Once a dense fern canopy is formed, weed growth will be shaded out. Inspect the ferns throughout the season for insect feeding and fern dieback. Asparagus beetles chew on the fern, causing the stem to turn brown and reducing the yield the next year. Spray the ferns with an approved insecticide when beetles are seen. For disease prevention, spray with an approved fungicide on a 7 to 14 day schedule beginning when the ferns reach a 3 to 4 foot height and continuing until mid September. Do not cut down the fern growth at the end of the growing season. The all-male hybrids stay green until frost, enabling photosynthesis to occur longer throughout the season. Leave the dead fern growth intact over the winter. This catches snow for additional soil moisture and keeps the soil temperature about 5 degrees F cooler than bare soil with no covering of dead fern. The cooler soil temperature is helpful in delaying the early emergence of asparagus in the spring, when air temperatures might rise prematurely and then fall again, predisposing the spears to frost damage. Frost-damaged spears should be snapped and discarded. Remove the old fern growth by cutting or mowing as low as possible during the first week of April. Dead stalks are very sharp and can easily skin knuckles when harvesting new spears. Asparagus is spring’s most luxurious vegetable. It was once cultivated for medicinal purposes as a natural remedy for blood cleansing and diuretic properties. During the Renaissance, asparagus was also promoted as an aphrodisiac and banned from the tables of most nunneries. 1. Select young tender spears. Wash thoroughly and sort into like sizes. 2. Trim ends and peel or use the “break method” described above. Cut spears into even lengths to fit freezer bags or freezer containers. 3. Water blanch small spears 2 minutes, medium spears 3 minutes and large spears 4 minutes. 4. Remove from blanching water and immediately immerse in ice water for 5 minutes to cool. Drain slightly. 5. Package, leaving no headspace, seal, label, date and freeze at zero degrees or below for up to one year. I have had very good luck growing onions – and am I glad! My favorite are red onions – they are so much better than yellow or white onions on most everything. Unfortunately they do not last as long as yellow ones which is not a problem because they get used so quickly. Another plus is I can grow green onions; which I love. Check out some good recipes at dougthecook.com. Make sure the onions bought are long-day onions; short-day onions are for the South and do not grow well in the Midwest. My onions are planted in the spring from sets as that is the easiest way. If the onion is larger than a dime, use those for green onions. Remember to plant them with the roots down (one year I planted several with the roots up – they were about one half the size of the ones planted with roots down). Good Friday is when I plant the cool weather crops: onions, potatoes, spinach, lettuce, and radishes. You could plant the last week of March but Cletus insists on Good Friday. The onions should be planted 1 inch deep. If you are growing green onions, plant them 2 inches apart from the dry onions and put them every other onion. They will be pulled before crowding becomes an issue. If no green onions, put them 3 inches apart. Put the rows about 1 foot apart. Do not hill onions or else they may rot at the base. Onions have shallow roots and are easily taken over by weeds. Boy, do I know about that! Late in the season the onions are almost indistinguishable from weeds unless you are ruthless at keeping them weeded. Foxtails are especially prevalent near harvest time. Many farmers do not bother weeding them – too much work…and I agree – it is a lot of work keeping them weeded. I side dress onions with 10-10-10 fertilizer about half way through the season. Onions are watered once a week, depending on the rain, so they get 1 inch total. Yank the green onions when they are about 6 to 10 inches long – they should be crisp. If any have stalked, use them immediately as they are not very good if they sit out. Harvest dry onions in late July or early August when most of the tops fall over. I use a potato fork to harvest them. Trying to pull them out resulted in too many broken tops. Allow them to fall over naturally; that way they produce the biggest bulb. Scallions have no bulb while green onions have a 1 to 2 inch bulb. Try and use green onions and scallions soon after they are harvested. Store in a perforated bag in a refrigerator up to 1 week after harvest. After harvesting the onions in the morning, let them sit in the shade for the rest of the day; unless it is raining. Put them on screens or hang them for 2 or 3 weeks. They need full air circulation in a fairly low humidity place. Many farmers put their onions in the attic where it is nice and dry. After the bulbs have dried cut their tops off 1 or 2 inches from the bulb. Discard any bulbs that have green growing from them. Store in a cool, dry place. They should last until late winter. Ideally storage temperature is 33 to 39 degrees. 40 and over they start to sprout. Some farmers put their onions in burlap sacks to store them.